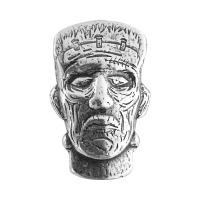 1.5 oz Monarch Precious Metals Frankenstein Monster Head Silver Bar | ?? 正面 a hand poured rendering of Frankenstein's face. 反面 The monarch logo followed by "1 1/2 Troy Oz 999 Fine Silver" over a smooth hand poured surface.